This will be updated over the next couple of days, but here are the pictures from the big 20,000pt Apocalypse game at Warhammer World! January 5, 2015 in Apocalypse, Battle Report, Blood Spectres, Dark Angels, Dark Eldar, Eldar, Necron, Space Wolves. Quick batrep! Haven’t had one in a while, and this was the second game at Jack’s place and the first on the new Necromunda-style terrain! Loads of catwalks, platforms and ladders. Can’t wait to get it all painted! Initially we were going to do a scenario with the Dark Angels trapped in the Dark Eldar city of Commoragh and they would have to get to a comms unit objective (to allow them to call in reinforcements), but we were running out of time to set everything up, so we did a simple layout with 3 objectives down the middle of the battlefield at 1250 points. No vehicles, just footsloggers! Dark Angels took Belial with a large Deathwing bodyguard, plus 2 more smaller squads of Deathwing. All would Deep Strike in but only Belial wouldn’t scatter at first. Dark Eldar took 3 10-man squads of Kabalite Warriors with 1 Splinter Cannon and 1 Shredder each, 20 Hellions, 2 5-man squads of Scourges and a tooled-up Archon with a large cohort of Incubi. 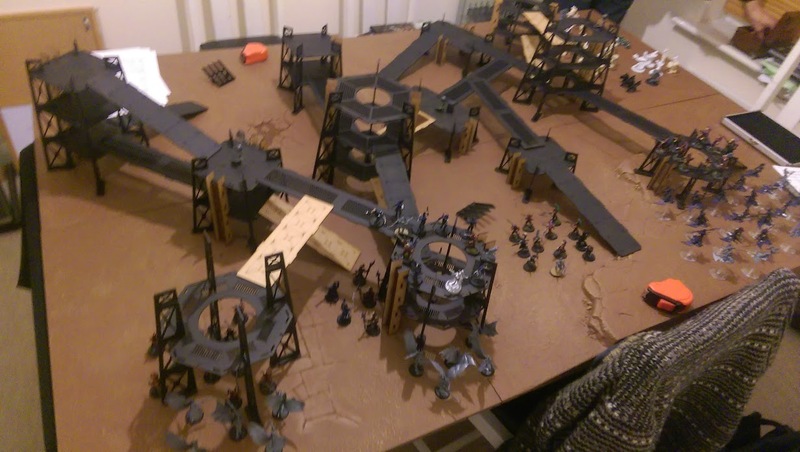 December 2, 2014 in Battle Report, Dark Angels, Dark Eldar, Necromunda, Warhammer 40K. November 10, 2012 in Dark Eldar. November 9, 2012 in Battle Report, Dark Angels, Dark Eldar. October 21, 2012 in Battle Report, Dark Angels, Dark Eldar.